"A cheap and easy favorite, cooks in 1 hour, only 5 minutes to prepare, kids love it!" Creamy and cheesy breakfast hashbrown casserole. I believe the recipe should have one - 8 ounce sour cream. The recipe I use also calls for two eggs. 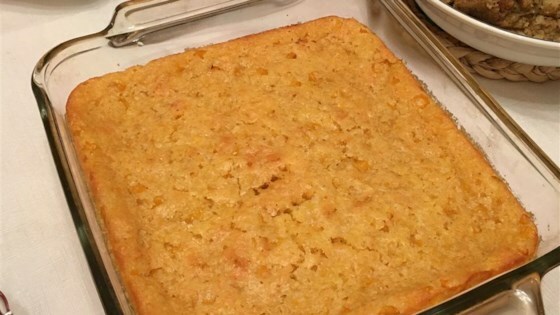 We used 3 cups of Marie Calendar's cornbread mix (sweeter than most mixes), about 1/2 cup sour cream, and 4 TBS melted butter. Everybody loved it. I love this recipe. I accidently left out the butter the last time I made this, but the taste is still the same! I'll be omitting the butter from now on when I make this.